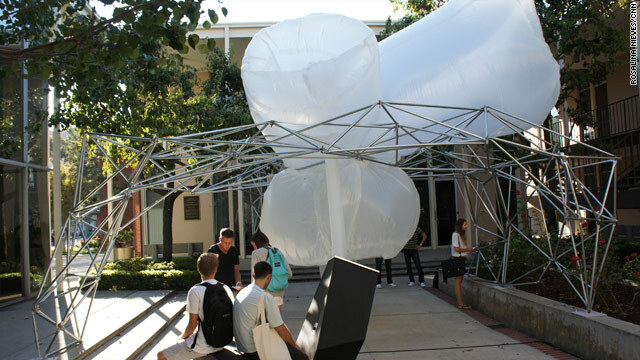 The inflatable chapel opened at the University of Southern California in August. Los Angeles, California (CNN) - At first glance, the blown-up plastic bags affixed to a jungle gym-like frame residing in a University of Southern California courtyard looks like a piece of public art, pure and simple. But the structure's creator says it’s something more: a sacred place for people of all faiths. He calls it an inflatable chapel. “I wanted to create a spiritual structure, so I combined every symbolic piece of religion and geometrically combined them to represent them in this chapel,” says Gail Peter Borden, an architect and assistant professor at the USC School of Architecture who designed the structure. The chapel, which went up earlier this month, incorporates the cross, the Star of David and the yin and yang, among other religious symbols. Borden, an Episcopalian who says he's not very religious, wants to redefine notions of sacred space. He says his love for architecture, art and religion inspired him to create the chapel, which is made of aluminum electrical conduit and translucent vinyl plastic. Though it bears little resemblance to a traditional chapel, Borden says it connects visitors to a higher being, whoever that being may be. Reverend Jim Burklo, Associate Dean of Religious Life at USC, says he learned about Borden when a local paper ran story profiling an earlier inflatable chapel that he crafted. That chapel resembled an igloo. Burklo thought an inflatable chapel at the university would provoke students’ curiosity. USC commissioned the structure. Doran doesn’t affiliate with any religion but said he might return to the chapel again. Still, he was skeptical of experiencing a spiritual connection. Burklo hopes the chapel offers students like Doran have a chance to step out of their usual way of looking at the world, to experience something spiritual, even if they don’t describe it as a religious experience. “This is a visual experience that helps them express that and feel that, that side of themselves,” he says. The chapel will stay in the courtyard of USC’s religious center until December. Borden says he then plans to reconfigure the chapel into a new design and is considering other sites for it.